One of the hallmarks of my childhood was visiting the local fast-food outlet after church. Every Sunday, my parents would take me to either McDonald’s or Jolibee for a kid’s meal. Before our order arrived, I spent my time exploring the neon tunnels of these playgrounds. Some kids relished the ball pit, others formed a queue around the slides, but for me, the best part was the trampolines and being able to jump around and say hi to my parents while I was bouncing. 20 years later — over the weekend, I found myself reliving those days again — albeit with the knees of an adult. Stepping inside a trampoline park in Al Quoz, I was reminded of the fastfood playgrounds of my youth. 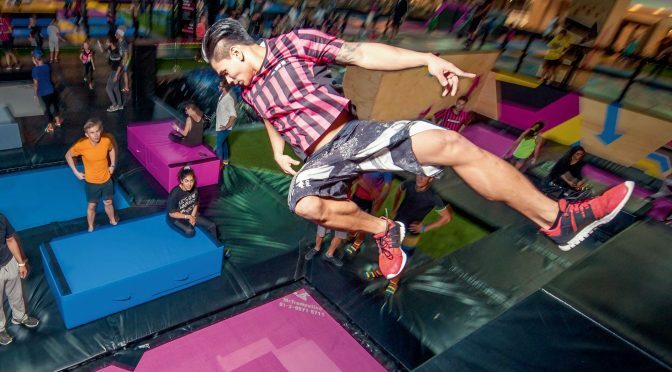 Bounce is one of the two indoor trampoline parks in Al Quoz. The other is called FlipOut, both not far from my office. This time, however, the playground wasn’t just relegated to one corner of the place, it was the entire place. Trampolines of all shapes and sizes surrounded me and my brother, Charles, as we geared up for Bounce. By gear up, I mean, we just changed our socks and removed our glasses. Because spectacles and gravity don’t go well together — even if Bounce’s regional manager, Chris told us that it was okay. “Jump higher! This is only a warm-up! We have more stuff to do today!” Chris declared as Charles and I jumped on the trampoline. On my right, my brother was having an easy time making all the manouevres: raising his legs upwards and trying to touch my feet mid-air. I, on the other hand, was falling flat on my back every time and sweating like I had just jogged 7,000-metres down Jumeirah Beach on a summer day. In between doing different stunts, Chris told us about himself. Trampolining wasn’t just a fun activity, he said. It was also exercise. “This is good cardio, just like running, your legs become stronger.” Besides his managerial duties, I learned that Chris took part in competitive trampolining, becoming a world champion thrice. We even conversed in Filipino after I learned that he spent a whole year in the Philippines. From English, we shifted to Filipino and then Spanish in between sentences. It was a welcome breather before we did the next set of moves. There were no slides or ball pits, but there were basketball hoops, a bunch of props for stunts and an obstacle course. I like to think of it as a “grown-up version” of my childhood playgrounds, even though there were children around. During the basketball trampoline, I became immensely proud of myself. When I was young, I steered clear of basketball. Once, long ago, I tried to shoot a ball and it flew back into my face and made sure I would never try to play the game again. Yet here I was, with Chris asking me and my brother to put the ball through the hoop. My brother, despite being an accomplished basketball player, didn’t score. When it was my turn, I felt my younger self lifting me up to do a lay-up, which eventually made its way through the hoop — score! Thanks to that boost of inspiration (and the trampoline), I finally crossed out a frustration I once had as a kid. With only a couple of more minutes left, we then sampled out a few props which they had lying around. They had rubber skis, snowboards and even bicycles (with the wheels removed. These props were reinforced so that they don’t cause a hazard. After watching Chris and his team perform stunts using them, we were asked to give them a whirl. There’s a game released in 2001 on the Playstation called SSX Tricky. The mechanics were simple, you played as a snowboarder, raced downhill against computer opponents, while making a series of jumps and flips using the numerous ramps sprinkled along the route. Strapping on the skis, I felt like a character from that game as I trampolined and did flips wearing them. There I was doing backflips, rotating mid-air, lifting my legs while skiing downhill on a winter landscape inside my head. Despite my legs feeling a twitch for a week, trampolining gave me the same blushed smile I had while I waited for my cheeseburger. Bouncing around reminded me of the joys of being in the air, looking at everyone below and forgetting the fact that I was perspiring and exhausted. It was mindless fun, and I had a ball. Previous PostWhy Tom Cruise is on a mission to just remain Ethan HuntNext PostWhat do you do when pest control is useless?